Ocean City, New Jersey is known as America's Greatest Family Resort. 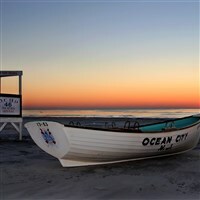 Ocean City has clean beaches, a world famous boardwalk, and events. Each year hundreds of thousands of visitors travel just to visit Ocean Citys Boardwalk. For many, its a family tradition filled with anticipation up to the moment they step onto the Boards. Discover for yourself why this popular Jersey Shore Boardwalk is the vacation destination of people from all over the world. Starting June 15th, catch the bus from one of our three convenient pick up locations and spend the day on the beach or boardwalk in Ocean City, NJ. The 13th Street Bathhouse offers a special price of $8 per person to include a shower and a beach tag. Regular price is $13 per person. This special is offered on a first come, first served basis and each person must provide either $20 (CASH ONLY) or a drivers license that will be returned to them when they return the beach tag.